Luton interim boss Mick Harford described it as a 'privilege' to be nominated for January's Sky Bet League One Manager of the Month award. The Hatters legend, who turns 60 next week, was given the role after former manager Nathan Jones left to join Stoke City in the week before Town’s trip to Sunderland. 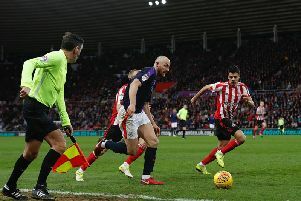 Harford led the side to a hugely creditable 1-1 draw at the Stadium of Light, with Danny Hylton's red card potentially robbing the visitors of a chance of victory. He has then masterminded wins over Peterborough, Southend and Portsmouth, taking 10 points from 12 as Luton climbed to the top of the table. Harford faces competition from Stuart McCall (Scunthorpe), Lee Bowyer (Charlton) and Derek Adams (Plymouth), as on the nomination, he said: “I keep saying, I was absolutely thrilled to be offered the caretaker role and it’s a privilege to do it. "I keep saying it, especially being in charge of these bunch of lads, because they deserve the credit. Harford will take charge of his sixth game at the weekend when Wycombe visit Kenilworth Road, as he on the future, he continued: “My role won’t change, until I’m told differently, I’ll carry on doing it. "I don’t know how long it’s going to be, it’s a role that they’ve asked me to do and I’ll just keep on doing it until things change. "I’ve got no idea, who it will be and when it will be." The head of recruitment denied having been asked to take the position until the end of the campaign either, saying: "No, I haven’t been asked to do it until the end of the season. "What does interim mean? Does that just mean the short term? I don’t know. "It’s a role that I’ve been asked to do and I’ll just carry on until I’ve been told differently." Meanwhile, defender James Justin was eager to praise Harford for the work he has done since replacing Jones. The full back, who has been ever-present under the interim boss, added: “He’s up for manager of the month and he’s only interim, but he’s been doing a great job of taking over from Nathan and long may it continue. "He's got history here, but I just think he's a top guy. "Everyone thinks he's a legend as a person, even before you look at his record with Luton and other clubs. "Because he's around here so much and was around here so much before the gaffer left, it helped a lot with what he does out there (on the training ground). "The transition was smooth as anything and he knows all the players, knows our tendencies and stuff like that, so it's just been seamless. "I think he's mellowed out a bit nowadays too. He's the same as Paul Hart, he mellowed out as well. "It must be us changing them, but he's a top guy and everyone respects him as a legend."